Enugu Summer of Code is a holiday program hosted by Soparkids international in collaboration with local and international partners to develop young people, especially kids in the area of coding/programming. It is a practical-based program that focuses on catching the interest of kids at a very young age in the areas of writing codes for mobile applications, games and web sites. The summer program also deals with the assembling robot hardware and writing the codes that control or instruct these robots. 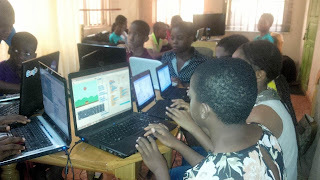 The main motivation behind the Enugu Summer of Code is to introduce the kids to the unlimited wonderful world of programming, artificial intelligence and digital technology, early enough so as to maximize the high interest, creativity, drive and energy associated with teens and adolescents in the development of practical solutions for individuals, organizations and governments. Digital technology, especially coding/programming requires enormous creativity and energy for maximum efficiency. However, it has been observed that most people in the coding world usually get involved (start learning) coding in their early 20`s and some in their 30`s, when they are already being burdened with personal, family and societal responsibilities. These responsibilities compete with their coding interests for their creativity, energy and time; thereby reducing the heights they could have attained in coding and digital technology. This factor alone ranks high amongst the major reason for the slow development of the digital technology in sub-Saharan Africa. Having known this, we cannot just sit and complain. We have to do something, a solution that will work must be implemented as soon as possible so that Africa, Nigeria and the South east in particular, will properly play their leading role in the global scheme of things. This is the major motivation behind the Enugu Summer of Code. If we can catch them (their interest) young, then the interest and the skill can be easily and more efficiently developed to enable them become world class developers of working solutions. 2. Scratch Team (MIT), USA. Currently, Enugu Summer of Code is mainly focused on teens of 6-18 years. The facilitating company, SOPARKids International has training packages for young and older adults. How can one be a part of this? To have your kid(s) take part of this revolution, log onto www.soparkids.org/SUMMER.html and fill the application form. You will be contacted as soon as possible. Give your kids this opportunity and help us really realize our vision of raising the next Bill Gates from this part of the globe.